When Sonic The Hedgehog was released in 1991, it almost immediately replaced Altered Beast as the pack-in game for the Genesis. The game was developed to take the Super Mario Bros. series head-on and shares a number of similarities with that franchise. Both are platform games that involve the player collecting items, receiving power-ups, and fighting boss battles. What separates Sonic The Hedgehog from all previous platform games is its sheer speed, which was intended to show off the processing power of the Genesis. The game shows off its speed through the use of power-ups, spring boards, and vertical loops, and almost never suffers from any slowdown. The game is made up of 6 “zones” of three “acts” each. Each zone has a unique theme (and its own background music) separate from the other zones, unlike the Super Mario series. At the end of every zone Sonic has to fight the evil Dr. Eggman (each time manning a different vehicle), who always narrowly escapes his own death. 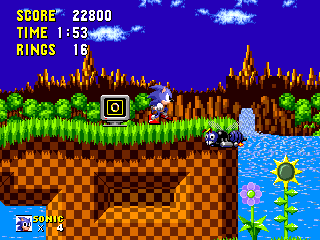 Bonus stages appear in between the normal stages (if you finish the stage with at least 50 rings) and give Sonic a chance to reclaim one of the 6 “Chaos Emeralds”. These “Secret Zone” stages present themselves as rotating mazes with elements of a pinball machine, and end when Sonic either falls into one of the “GOAL” areas, or successfully grabs the chaos emerald. Collection of all 6 chaos emeralds is required in order to get the better ending of the game. The game’s graphics show off the strengths of the Genesis while hiding its weaknesses. Unlike later Sonic games, this game doesn’t try to do too much with too little, resulting in colorful and detailed environments. The game also features a fantastic and memorable soundtrack written by Masato Nakamura, a musician well-known to fans of the “J-Pop” genre of music. Sonic The Hedgehog is easily one of the best games on the Genesis, and one of the best platform games of all time. Buy Sonic the Hedgehog on GameGavel or Amazon. Tagged genesis, Platformer, Review, sega, Sonic The Hedgehog. Bookmark the permalink.